LETHBRIDGE - A southern Alberta women's group is hoping some woolly wombs will make a point with politicians in Ottawa. Members of Womanspace in Lethbridge are asking that people crochet or knit copies of women's reproductive organs that will be sent to Parliament as part of a nationwide protest. A knitting night, the second one this month, is planned for Tuesday at a neighbourhood pub. "People do different colours, but pink has been the dominant colour for the obvious reasons. 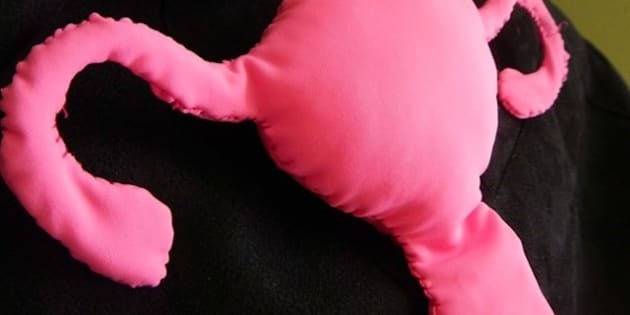 But it's also a little bit funny to be sending a pink uterus to a male member of Parliament who wouldn't feel comfortable holding one," said Womanspace spokeswoman Jenn Prosser. The advocacy group is concerned about a private member's motion by Tory MP Stephen Woodworth that a committee re-examine when a fetus should be considered a human being. Women's groups say that would reignite a national debate on abortion that could eventually make it illegal again. The Supreme Court of Canada ruled in a high-profile case in 1989 that a fetus has no legal status as a person. A Quebec man named Jean-Guy Tremblay had tried to get an injunction to stop former girlfriend Chantal Daigle from getting an abortion. He said he was protecting the fetus's right to life. But the high court ruling made such an argument invalid. Prosser said it's important that politicians know any changes to women's reproductive rights won't be tolerated. "Our group is going to send a few of our creations to our own MP (Tory Jim Hillyer) because he has stated ... he would support any challenge to the current access to reproductive rights that women have in Canada," she said. Additional knitworks are to be sent to Parliament at the end of August as part of a national movement on Facebook called Womb Swarm Parliament — Textile Artists United Against Motion M-312. The knitting nights have helped foster a sense of solidarity, Prosser said. "By creating that community, you're ... giving people who may not know that there are others who feel strongly about this issue an opportunity to come together to talk about, to bond and discuss the issue in general." About two dozen creations by Womanspace members or supporters exist so far. And, as with any craft, the appearance varies. "Everyone has their own style of knitting and crocheting to begin with, so they all look pretty different," Prosser said. A couple of creations have come from men who support the advocacy group, although the guys haven't shown up in person — and their work leaves a bit to be desired. "Typically knitting is a skill that women learn." "I think there's a great number of people ... who believe very strongly in reproductive rights and the right of a woman to have control over her own body. But I think a lot of people maybe wouldn't feel comfortable holding a placard outside of someone's office. "This is a way that they can participate that's meaningful, but still on their own terms, without necessarily having to go out and put their face in front of someone else's face in more of an aggressive manner." Woodworth's motion is to be voted on in the fall session. Prime Minister Stephen Harper has said he will vote against it, although he's pointed out every private member has the right to table bills and motions. Opposition politicians have accused the Tories of using a backbencher to help reopen the abortion debate.